Freedom and Flourishing: Should we choose eudaimonia over hedonia? Last week my attention was drawn to the findings of some recent research, led by Barbara Fredrickson, which suggests that eudaimonia – which can be described in broad terms as a sense of wellbeing associated with a noble purpose or engagement in meaningful activities - provides positive health benefits in protecting against a variety of human ills, including arthritis, heart disease and viral infection. By contrast, the study suggests that hedonia – a sense of happiness associated with pleasure, satisfaction and self-gratification – has the opposite effects. The findings are noteworthy because previous research has suggested that both eudaimonia and hedonia are associated with improved physical and mental health outcomes. I feel more inspired than surprised by the findings. Like many other people I was brought up to believe that a noble purpose can be protective, but in adult life I viewed that as more a matter of faith than anything else. It is interesting to learn there may be a scientific basis for such beliefs. Like previous studies, this study indicated that there is a relatively high correlation observed between eudaimonic and hedonic indicators of happiness (r= 0.79). People who score highly in terms of eudaimonic happiness tend also to score highly in terms of hedonic happiness, and vice versa, but there was nevertheless sufficient difference to enable the impacts of eudaimonia and hedonia to be disentangled. The authors’ conclusion is a bit complicated, but it seems to be implying that if the ‘good life’ means a long and healthy life, then eudaimonic wellbeing is superior to hedonic wellbeing. I struggle to understand what some of that paragraph means – the findings of the study seem to me to suggest that some kind of trade-off between eudaimonia and hedonia must be involved, despite the existence of complementarity. The issues involved appear a little clearer, however, when I bring my training in economics to bear and think in terms of a possibilities curve that surrounds all the combinations of eudaimonia and hedonia that it might be possible for an individual to achieve. The sentence in the paragraph quoted above about the findings saying more about ‘which form of well-being one would not want to do without, rather than which form one would be better to avoid’, seems to envisage a person who is at a point inside the possibilities curve, such as the point at the question mark. 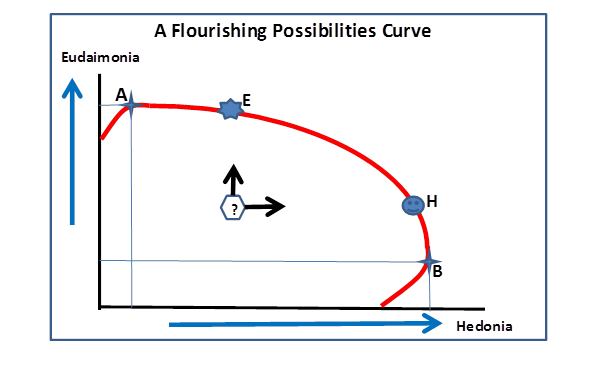 A person in that position might be considering whether to seek to become happier by moving in the direction of point H or point E.
I should emphasize that the possibilities curve I have drawn is based mainly on my speculations and may not be related to what Barbara Fredrickson and her colleagues have in mind. · First, we need to know ourselves well enough to know where we stand at present relative to the possibilities that are available to us. · Second, additional information (such as the findings about potential health consequences in the study discussed above) has potential to help us to choose wisely among the possibilities that are available. My final point is the same as the point I made a few years ago in discussing whether J S Mill was correct in his rejection of Jeremy Bentham’s claim that pushpin is a good as poetry. There doesn’t seem to me to be much point in arguing whether eudaimonia is or is not superior to hedonia. The important issue is about obtaining balance in one’s life. Labels: capability and opportunity, Frames and beliefs, inner freedom, Practical wisdom, Well-being and utility, What is happiness? Didn't the Stoics and Pythagoreans also believe that virtue or noble purpose as you put it, are protective? I understand what you mean about taking that on faith because there is no way to prove it, just like there is no way to prove my suspicion that it is true because of a Natural Law which governs the cosmos. I may link to the study you reference if I decide to write about the topic. I look forward to reading more of what is on your blog! Thanks for your comments Leah. On reflection, when people are living according to their values, that would enable them to avoid internal conflict that might otherwise make them tired and vulnerable to some forms of illness.